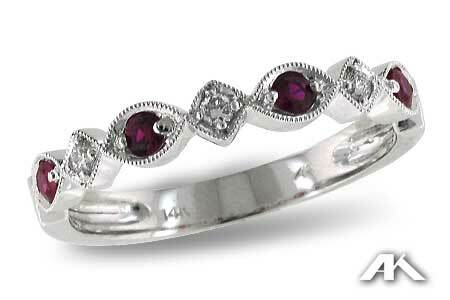 Round rubies and diamonds alternate in this dramatic scalloped edge band. The band has delicate vintage-look milgrain edges. Alternating diamond shapes and oval shapes hold the vivid stones. This makes a wonderful wedding band, fashion ring , or a stackable ring.